Charleston, WV: In four innings of work on the mound for San Francisco Giants #25 ranked prospect Seth Corry, the left-hander did not allow a run while striking out seven over four frames. Unfortunately, the Augusta bats could only get a solo home run late in the game from Aaron Bond, and they fell 2-1 to the Seattle Mariners Single-A affiliate, the West Virginia Power. Steven Moyers gets the win on the mound for West Virginia following seven innings of scoreless baseball with nine strikeouts. In the GreenJackets five losses this year, they have combined for a total of six runs. In the four wins, they have eight or more runs in each game. 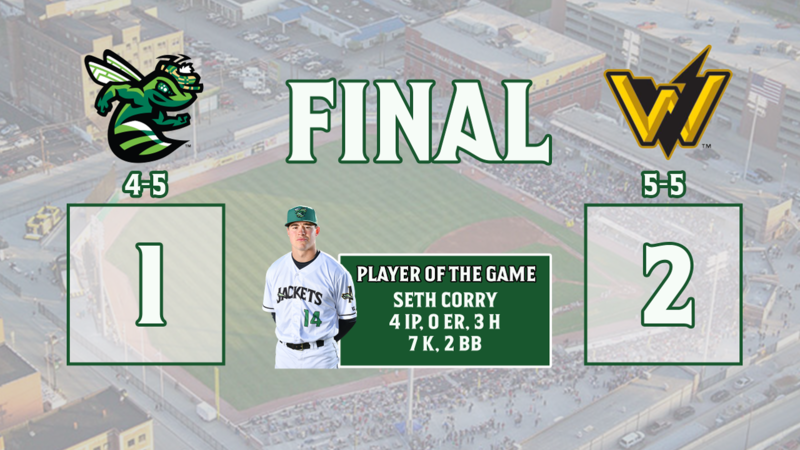 After Corry went four innings for the GreenJackets, Keaton Winn came on in relief. In the 5th inning, with the bases loaded and nobody out, West Virginia's Ryan Ramiz hit into a fielders choice allowing Ryne Ogren to score, plating the games first run. Winn surrendered another run on a sacrifice fly from Cesar Trejo in the 8th inning to make it a 2-0 West Virginia advantage. In the 9th, Bond led the inning off with his first home run of the season, but the GreenJackets went down in order after that, and fell 2-1. Daiyeson Arias gets the save for West Virginia. Following his first start where Seth Corry went three innings while striking-out seven, the five walks he surrendered were something Corry wanted to improve on. In outing number two of the season, Corry did just that. He finishes his afternoon going four innings while striking-out seven and walking just two batters. Sunday may feature the best pitching matchup in the South Atlantic League between Augusta and West Virginia. 2nd Round pick in 2018 Sean Hjelle for the GreenJackets will face 1st Round pick in 2018 Logan Gilbert. While Hjelle picked up a loss in his last start, the right-hander tossed five innings of two-run baseball with four strikeouts. The five innings were the most he's thrown in an outing for his career. Logan Gilbert sat out all of last season with a toe injury and viral infection, but the right hander is listed as the 6th best prospect in the Mariners organization. Gilbert went 14th overall in last years MLB draft and in his first two starts he has not allowed a run over nine innings of work.